27/12/98 Cheshire ornithologist A.W. Boyd always recommended spending part at least of the holidays of the Church out of doors, a fine sentiment and one we have tried to follow at some stage over the Christmas period for some years now. By tradition those able to attend meet at Arley Hall and follow the public footpaths to picturesque Great Budworth (now the home our independent MP and ex - BBC correspondent Martin Bell, apart from Bob Groom probably the most famous white suit wearer in the world!). The dreaded flu bug reduced numbers somewhat but the most original excuse must go to Pete Hall who felt unable to attend this year owing to the fact that his roof was removed by last night's 80 mph+ gales! Despite the wind and recent rain the going was not too bad, Winter Thrushes were everywhere especially Redwings who seem to outnumber Fieldfares at the moment, a flock of 30 Tree Sparrows was nice to see but the best bird was a superb male Lesser Spotted Woodpecker watched at close range in the grounds of Arley Hall shortly after setting off from the "walker's car park". 21/12/98 The shortest day already, Spring is just around the corner! - well the local Mistle Thrushes think so, there were two in song today on an early morning stroll round the village despite a sharp frost during the night with a minimum temperature of -5ºC showing on the maximum and minimum thermometer. Some roadside ditches remain unfrozen and one of these had attracted a fine Grey Wagtail, not a rare species but unusual along that particular stretch of road. The annual Christmas Party went ahead on the 11th. and was, as usual, a resounding success, one interesting bit of information from Mere where counts of 50+ Tree Sparrows have been obtained again from the usual garden, no wonder the rest of us never see any in the rest of the County! 5/12/98 An excellent turnout today for what has become an annual trip to Marshside and Martin's Mere, two reserves in Merseyside run by the RSPB and the Wildfowl and Wetlands trust respectively. The weather was cold, very cold!, the mercury remaining close to freezing all day, but we had unbroken sunshine with super visibility, from Marshside Blackpool Tower and the Big One stood out well, behind them the snow - covered hills of the Lake District were clearly visible. There was a big tide (9.9 meters) and the flocks of waders we had seen from the car on the road from Southport were forced into the air by the incoming waves which were moving rapidly towards us backed up by a strong westerly wind, there were thousands of waders with both Black and Bar-tailed Godwits, Oystercatchers, Dunlin, Knot and Grey Plover present. The water on the south side of Marshside Road held a huge number of Wildfowl with Wigeon, Shoveler, Pintail, and Teal well represented, the Ribble Estuary is the most important site in Britain for the Wigeon, it's estimated that up to 100,000 individuals Winter here - there were 7,500 at Marshside today! Martin's Mere held large numbers of Pink-footed Geese, 5,400 had been estimated by the staff earlier in the day, 54 Ruff were counted amongst the flocks of Lapwings but pride of place went to the Whooper Swans, there were 1,074 on the reserve a record count with 33 more than last year. itself a record at the time. 26/11/98 Pintails were quite common in Tatton during the 1970's and 80's the record is a count of c.130 birds present during a wildfowl count on a cold and misty morning in February 1979, [a memorable day for those present as there was also a Red-necked Grebe on the main Mere at the same time. Always ready to put one over on the Rostherne crew we hastened to the nearest phone box (no cell phones in those days!) to report our mega tick to the then Warden, Tom Wall who offered us his congratulations but then spoilt things by informing us that they had just had two on their Rostherne count!] Anyway back to Pintails - at that time they were common visitors in their hundreds to Rostherne, Tatton was not as attractive to the species but flocks from Rostherne often overflew the Park. Numbers visiting this part of Cheshire have, for some reason, dropped dramatically since then, in fact the latest Cheshire Bird Report (1997) records Rostherne's lowest maximum count since 1961; only 9 birds, consequently Tatton now has very few records so a fine male was a welcome sight last week as it swam on Melchett Mere with a group of 15 Wigeon. Elsewhere finch flocks are currently smaller than last year at this time, but they were exceptionally large in 1997, nevertheless we did come across a gathering of 60 in Dog Wood feeding below the Oak trees, mostly Chaffinches but they were accompanied by a handful of Bramblings, their white rumps showing well as they moved in a loose group through the wood. 14/11/98 The first Bramblings of the Winter arrived back with us this week, the Tatton log has details of two birds on Wednesday and a single last weekend, all were identified by their distinctive calls, well worth learning if possible so avoiding the frustration of yet another unidentified flyover! None were seen or heard this morning amongst a substantial flock of c. 100 finches feeding in the alder trees on Knutsford Moor, most of these were Goldfinches with a few Siskins and surprisingly, what seemed a high percentage of Redpolls. 04/11/98 For the past few days articles in that most excellent of all the internet's 30,000+ News Groups - uk.rec.birdwatching - have spoken of record numbers of Fieldfares arriving on the east coast after the perilous journey across the North Sea from their Scandinavian breeding grounds. Here in Cheshire we had seen none, although their smaller cousins the Redwings have been around for sometime now, until this morning however, when a huge flock of c. 600 birds passed overhead in a loose straggling flock, their harsh, chattering calls reminding us that Winter is upon us once again - not that we needed any reminder as our friends from the North brought with them the first wet snow shower of the Season! 01/11/98 When we first visited Speyside in the early '70s the RSPB were doing their best to encourage Goldeneye to remain and breed rather than to return to Scandinavia after overwintering in the UK by providing nest boxes at suitable sites by the sides of Lochs and the River Spey itself. The scheme has been a great success and from the first confirmed breeding record in 1970 the number of pairs has increased rapidly. Although there is a record of a pair nesting in Cheshire in the 1930's we know it only as a Winter visitor, generally from mid-October on Tatton Mere with peak counts in early Spring as the birds prepare to return North to breed. The first birds returned a little later this year and it wasn't until today that we saw the first birds of the Winter on Tatton's Melchett Mere, a male accompanied by 6 female/immatures, probably a family party - they seemed reluctant to stray more than a few yards from each other but nevertheless appeared quite settled. Eric Hardy in his excellent "Countryside" program tonight on Radio Merseyside (6.30pm - 95.8 FM) reports 3 Swallows seen at nearby Rostherne Mere yesterday (31/10), late but in 1980 there was one at Tatton on 11/11. 20/10/98 The first frost of the Season on Saturday night with the thermometer registering -2°C at 6:00am, not the sort of weather for House Martins but there were still five birds on the Mereheath Park estate the previous day, they may linger a while yet I've seen them in previous years well into the first week of November. No Fieldfares so far although this morning a flock of 12 Blackbirds seen on my morning walk were newcomers, there are so few resident birds that they were a significant record and will no doubt soon be joined by their cousins from the far north. 12/10/98 The run of easterly winds continued until mid-week and brought with them the first few Redwings those delightful little thrushes from across the North Sea that will remain with us until early Spring when the lengthening days and warmer weather prompt them to return to their Scandinavian breeding grounds. Four birds were the forerunners they had arrived before our remaining Swallows had departed, there were still 10 over Dog Wood on the 9th but the first westerly gales of the Autumn over the weekend may serve to remind them that despite the dangers of the journey it's a lot warmer in Africa at this time of the year! 4/10/98 With easterly winds predominating for most of the last week we were expecting the first of the Winter thrushes to make their appearance but they have failed to appear so far, although they are present in good numbers already on the other side of the Pennines. Few Skylarks to report so far, they are usually to be seen and heard flying south and west on the clear cool mornings we've experienced over the past few days. Little to report in Tatton this morning although Tufted Duck had increased to 127 but accompanied by only 4 Pochard a very poor count, things bucked up though as we made our way out when a familiar sound drew our attention to a flock of 23 Pink-footed Geese the first of the autumn and much earlier than average. 24/09/98 The 18th. of September seems to be something of a watershed this year, the previous day on my early morning walk round some pretty uninspiring farmland on the edge of the village there were 24 Swallows perched on telegraph wires warming themselves in the morning sun. The next day only four remained, most seemed to have departed on the start of their long journey to the South, in their place came the first Meadow Pipits of the Season, squeaky calls revealing their presence in the short interludes of relative silence before the next jet took to the skies from nearby Manchester Airport. 17/09/98 Many years ago before the likes of us could afford cars, an annual treat was the trip to Blackpool in a "shara" (charabanc - coach). One of the highlights of the journey was the contest to be the first person on the bus to see the Tower, especially in bad weather when those who could remember the point in the journey when we caught our first glimpse in previous years lost the advantage! Old customs are rarely completely lost although they are sometimes amended or appear in different forms; I was always reminded of this in the early years of the Society when we ran Winter coach trips to Tregaron in mid-Wales for the Red Kites and Bob Groom would offer a Polo mint for the first person to see a Buzzard on the way - a small gesture perhaps but excellent for "team building" years before the term became trendy - with Bob a little like Martin Peters, 10 years ahead of his time! We would have been well into the journey, probably around Welshpool in those days before the first was seen and the victor claimed their treat, what a difference now, we'd quite possibly have one before hitting the Northwich bypass, such has been the Buzzard's recovery over the past few years. They appear to have had another good breeding season with reports from Tatton, Toft, Mobberley, Peover and Chelford all mentioning fledged young on the wing, but what of other raptors? I sense fewer Kestrels than of late but increasing Hobby sightings throughout the North-west, including one this week in Tatton scattering the hirrundines as it sped through the Park, pose the question - where are these from? 06/09/98 Hilbre Islands lie in the Dee Estuary off the coast of the Wirral, now a part of Merseyside but for ornithological purposes still regarded as a part of Cheshire. There are 3 islands in the group Hilbre, Middle Eye and Little Eye; Hilbre at 5ha is the largest and is a 2 mile trek across the sands from the town of West Kirby, the islands are surrounded by water twice a day for a period of up to four hours so some care has to be taken when visiting to avoid being caught out because the sea comes rushing in as fast as a person can run especially when backed up by south-westerly winds. We paid what has become our annual visit today, setting off from Knutsford at 6.30am to enable us to set out from West Kirby earlier than usual, at 7.30am, four hours before high tide, rather than the normally recommended three owing to a mid-week weather forecast that warned of gale force winds from the sea as the remnants of a recent hurricane hit Britain. These conditions would have provided some spectacular birding if they had come to pass, September gales can bring large number of Leach's petrels as well as rarities such as Long-tailed and Pomarine Skuas together with rarer Shearwaters and Sabine's Gulls. The gales though never occurred and so we missed out on a chance of some rarities, nevertheless it was pleasant to have such good views of so many species that are rarely recorded in our own inland area. Knots were the most numerous waders with many hundreds already present, some still had traces of summer plumage on their breasts, as did a handful of Dunlin that accompanied them. Oystercatchers and Redshanks were as vocal as usual as they were forced from Hilbre's sandstone rocks by the advancing tide, a familiar call drew our attention to a Common Sandpiper away from its more usual (to us) inland environment. Few passerines were seen except for a single Wheatear and a flock of Linnets, one of which was seen to have a narrow escape as the long staying Merlin singled it out as a tasty mid-morning snack! 23/08/98 The first signs of Autumn this week with increasing wildfowl numbers especially Tufted Duck, now up to 89, amongst these were three juvenile birds. Pochard were up to 22, whilst we counted 16 Ruddy Duck on Melchett Mere including 2 recently hatched ducklings. 300 Canada Geese rested by the side of the Mere, they were accompanied by 2 Barnacle Geese and c. 150 Lapwings, overhead large numbers of hirrundines especially House Martins with a high percentage of young birds, I sense they are having a good breeding season despite the wetter than average Summer. On Thursday we had no less than 5 Ravens, they could be last Winter's pair with 3 offsprings as it was rumored there was a nest in the Rostherne area, also seen Thursday was a Peregrine and three Swifts with an adult Arctic Tern over the main mere. 15/08/98 House Martins were late arriving back this Spring, our first wasn't seen over Tatton Mere until April 9th, compared with the second of the month in 1997. When they did return it was in smaller numbers than usual according to many observers and I believe the RSPB or the BTO were moved to organise an emergency count to establish if this was the case - although a "snapshot" count is of little immediate use with no data from previous years with which to compare it - but of course it would be useful in years to come. No sign of any shortage today at Toft Hall where one of our KOS members has been monitoring the House Martin population for some years, 67 occupied nests, which compares favourably with 1997's count of 69, there were plenty of juvenile birds in evidence and the adults were busy with second broods. 06/08/98 August has brought with it a fine crop of rowan berries; the wicky bushes as they're called by older folk in the south of Cheshire are laden with them and the Blackbirds are taking full advantage - and why not - this has been a terrible Summer so far and any birds that have struggled for so long deserve some sort of reward. Tufted Ducks can often be seen with newly hatched ducklings quite late on in the season but it's getting rather too late this year and so far I've seen none on Tatton, it was therefore a pleasant surprise to see a picture of a family of "Tufties" in the local paper, they had stopped the traffic wandering around on the road in the town center, I wonder where they nested? 26/07/98 The KOS hold both indoor and outdoor meetings every month throughout the year, but rather than waste the long Summer evenings the mid-summer indoor meetings are held outdoors - if that makes sense! Friday found us once again at Witton Flashes it was a little warmer than on our last visit although only just! progress was rather slow owing to an increasing interest amongst members in flora as well as fauna, there were many species to argue about! The gull roost on Neumann's Flash is beginning to build up as is the number of Lapwings with about 120 being counted, the hide overlooking number1 tank was "benchless" due to vandalism but it didn't stop us getting good views of two Green Sandpipers and a handsome summer plumage Black-tailed Godwit. The "Salt Barge" just a short distance from the Reserve with passable Burtonwood bitter and an extensive menu was our final stop shortly before dusk, unfortunately the last orders for food was 9:30pm so we missed out this time, but may return shortly on one of our KOS gourmet evenings! 19/07/98 Since the sad decline of the Mobberley Sand Quarry unusual wader records have become less and less frequent, we were delighted today when a Greenshank passed high over Tatton, it's distinctive call enlivening yet another grey, wet morning. Our Canada geese are on the wing again after their post breeding moult, their cheerful honking as they fly low over Knutsford are familiar to all the local residents, birders or not! We seem to be getting a little blasé about the Osprey, it appeared this morning at about 10:15am over Melchett Mere, did a few circuits of the main mere before flying off out of sight towards the East. 12/07/98 Despite a less than promising forecast the trip yesterday to Leighton Moss went ahead with no rain, just pleasant, comfortable weather with long periods of warm sunshine - just to remind us lest we forget that it's mid-summer. There was, of course, little of the way in song but a few Blackcaps, Song Thrushes and acrocephalus warblers were hanging on in there. At least one pair of Marsh Harriers have been successful and three young birds were seen with a pair of adults, at one stage these were watched flying low over a pool containing three Spoonbills, not a sight we would have considered possible in the north of England a few years ago! Interest amongst members extends to other aspects of natural history, especially plants and as this was our first Summer visit to the Reserve John and Brian were kept busy pointing out some of the rare and interesting flowers we'd just stood on! We were all delighted to see some butterflies at last and especially impressed with a rare High Brown Fritillary (Argynnis adippe) enjoying the sunshine in a sheltered clearing close to the eastern edge of the reserve. 10/07/98 Good news from Tatton tonight where we had superb views of our old friend the Osprey when it reappeared just before closing time making a half-hearted fishing attempt before making off to it's usual perch, no doubt waiting until all was quiet before returning for supper. Elsewhere a Lesser Whitethroat that had been singing up until a couple of weeks ago in Pavement Lane, Mobberley also made it's presence known again when I dallied a little too long near it's probable nest site above a ditch in a tangle of overhanging vegetation. 5/07/98 June was the wettest ever since records began and July has continued in the same vein, swallows feeding over a cow pasture had resorted to hovering over thistles and picking off insects from the stems, on closer inspection these proved to be blackfly. Many Yellowhammers were still in song and family parties of Garden Warblers and Linnets seemed to be coping successfully with the unseasonably cool conditions. A late night visit to a local farm failed to produce the reported Barn Owl but we had good views of both Tawny and Little Owls. 23/06/98 A very pleasant evening for the annual Bar-B-Que, it rained on the journey to Jill and Roger's but things improved quickly enabling the whole event to go ahead out of doors. After copious amounts of red wine it was decided that the next day we would have a thrash through Tatton and see if we could re-locate the Osprey, it seemed like a good idea at the time, but the previous evenings excesses were evident on one or two faces when we met up at 8.30 am. in the Dog Lodge lay-by! Fortunately the good weather had continued through from Saturday to Sunday and we were able to enjoy a leisurely stroll to the "Osprey Bench" via Knutsford Moor and Dog Wood. Reed, Willow and Garden Warblers, Chiffchaff, Blackcaps and the resident Common Whitethroat were all in song but the Osprey wasn't seen - it seems to prefer the undisturbed Rostherne reserve. Late update 23/06/98 - Reliable sources report a member of the Society seen talking to H.R.H The Prince of Wales at the Cheshire Show earlier today - no news yet about rumours that he will be joining us on future trips to Carsington Water or Blithfield Reservoir !!!!! 14/06/98 A poor turnout today for the trip to Lake Vyrnwy, it would be nice to see a few more of the people who have booked so readily for next year's 25th anniversary holiday to Lesbos supporting the Society on these run-of-the-mill trips. Always a good run on a Sunday morning, it took less than 90minutes from Knutsford to the Visitor Centre at the southern end of the 5mile long reservoir - built at the end of the last Century to supply the good people of Liverpool with drinking water. At the suggestion of the Warden we walked through the woodland covering the hillside around the Lake Vyrnwy Hotel, it was excellent and heaving with birds, some Wood Warblers were feeding young whilst others were again in full song, perhaps with a second brood in mind. Also feeding young, both Redstarts and Pied Flycatchers with good numbers of Willow Warblers, Blackcaps and Chiffchaffs much in evidence. Closer to home the Osprey was still in Tatton on Friday evening, it had spent some time fishing at Rostherne, there was probably a little too much disturbance on Tatton Mere for our long-staying Super star! 07/06/98 It's always nice to see an Osprey, to see the species in England is especially nice, so having a long staying bird on our own local patch is bringing a lot of pleasure to many people. Early visitors to Tatton this morning were rewarded with superb views of the bird perched in what has been known as the Osprey tree ever since a bird used it briefly a few years ago. Shortly after 9:00am the first fishing expedition of the day proved unsuccessful, the bird had many attempts but returned to it's perch without any breakfast! Reward though at about 10:30 when it caught a fair sized fish at it's first attempt, this was carried away to a second perch which we failed to locate. Our star visitor apparently returned to perch1 later in the day and provided viewers with a spectacular display as it took another fish from the Mere, this time returning to the Osprey tree to enjoy it's hard earned evening meal! 03/06/98 Despite not visiting Speyside during this years pilgrimage to Scotland we amassed a creditable total of 112 different species during our 7 days stay based in beautiful Gairloch high up on the west coast just below Ullapool. Amongst the highlights were a pair of Golden Eagles nesting on Skye right at the side of the road, quite unconcerned by a constant stream of visitors (including many non-birders) pausing to obtain some spectacular views of what appeared to be a well known site. Although we dipped on Uig's Corncrakes there was adequate compensation the next day when Gruinard Island's White-tailed Sea Eagle took briefly to the air after a long period of harassment by a very agitated Buzzard. Also of note were the breeding Common Scoter, Black-throated Diver from the cottage window and the spectacular breakfast cooked by Barry after an early morning sea watch from the road to Rua Reidh lighthouse! Nearer to home the trip to the Goyt Valley took place on the Friday before our return, it appears to have been successful with an e-mailed report from Helen and Adam mentioning good views of Grey Wagtails, Ring Ouzels and whinchats. 03/06/98 Late news - 4.30pm, an Osprey at Tatton - seen to catch a fish then fly to the "Osprey tree"! Last seen at dusk, apparently roosting. 22/05/98 All packed and ready to go, a week based in Gairloch, all passouts signed by those requiring them! All we need now is the weather! 19/05/98 Away from the Pennines the County of Cheshire is generally flat, but the plain is broken by a ridge of Triassic sandstones running from Wirral, along the Frodsham - Delamere - Bickerton ridge. At Beeston an outcrop 600ft. high and topped by a castle stands clear of the surrounding countryside and for the past ten years has been home for a pair of Peregrine Falcons. The birds nested successfully for the first few years, but after their presence became more widely known the site was regularly raided and the eggs stolen. Margaret Blinkthorne who farms in the shadow of the castle became their self-appointed guardian keeping a watchful eye on the eyrie whenever possible but was of course never able to maintain a 24 hour watch. This though is now made possible thanks to the dedication of a team of volunteers that has built up over the last few years after local people began helping Margaret on an ad-hoc basis. The Monday and Friday watches are organised by two of our members, John and Roy and I was able to join John on Monday morning during the early watch and was treated to some superb views of the male bird as it enforced a "no fly zone" around the nest site. The bird had apparently become much more aggressive since the hatch of at least 2 of it's 3 eggs and was busy scattering everything in sight including the resident Ravens who's own young have now fledged. 11/05/98. Despite the best efforts of Tatton's Rangers the Park is under-watched since Garry Healy moved south in search of (or to avoid) gainful employment! We only managed the last hour before closing time tonight but there was some serious movement underway. Swifts were much in evidence with c. 200 at 6:00pm and in the distance 7 sterna terns were feeding at the north end of the mere, they were all Common Terns, normally less numerous than their closely related Arctic cousins. As we watched two more of the same species arrived from the south, they were accompanied by the first two Black Terns of the year. Two Kingfishers sped past, a Crossbill flew over calling loudly and a Whinchat perched briefly before continuing northwards, by 7:00pm Swift numbers had increased to no less than 400 - all this in an hour - but what was missed today? 07/05/98 Like most other parents, from an early age we attempted to introduce our offspring to some of life's more rewarding and intellectually challenging pursuits but apart from a predilection for strong lager and the beautiful game we failed miserably with our son. Birdwatching was only acceptable when it involved long car journeys and the opportunity to operate his CB radio from a new and hopefully enhanced location! Consequently he remains unimpressed by the "goings on" in the roof space above his bedroom where a recently hatched family of starlings keep up an increasingly raucous cacophony from early mornings onwards, rising to a crescendo as the hardworking parent birds return periodically with food. Judging by the noise emanating from beneath most of the gutters in the area the hatchings all came at roughly the same time and it was interesting today to watch the adult birds shuttling backwards and forwards in what seemed their hundreds carrying beakfulls of food from nearby farmland back towards the village. Elsewhere in the same area a two hour walk produced mixed results, I covered about a square mile and counted 10 singing Skylarks, 11 Chaffinches and 8 Linnets, unfortunately I was unable to locate any singing Corn Buntings and only one Willow Warbler, two separate Lapwings were seen chasing Carrion Crows, indicating birds with eggs or young. A Buzzard was flushed from a possible nest site and an added bonus was a singing Sedge Warbler, my first of the year. Meanwhile back in Tatton a Wood Warbler sang briefly in the Log Book Wood with a possible second bird later in Dog Wood. A pair of Kingfishers may have a nest along the outlet stream from the main Mere, twice this week the log book mentions a bird carrying a fish seen heading off along the stream in the direction of the Old Hall. 30/04/98 Thanks are due to our hardworking Secretary Roy who has worked so hard on our behalf this week to book our 25th. anniversary trip to the Greek island of Lesbos in May 1999 - all a bit of a panic apparently, but mission accomplished with 24 places booked in our first choice hotel. Back to this year and the first Common Sandpiper appeared on Monday (27th) whilst last night just before chucking out time in Tatton we were treated to a fleeting visit by those most travelled of all migrants - 4 Arctic Terns - feeding briefly before leaving towards the North at 7:00 pm. 25/04/98 Our Summer migrants seem to making up for lost time now the weather has turned warmer ( but not dryer, we are experiencing the wettest April this Century and there is a possibility the all time record set in 1732 may be surpassed!). A Reed Warbler was singing on the Moor on Thursday (23rd) and a day later the first Yellow Wagtail was noted in Tatton. Today we heard the first Cuckoo on the Moor and this was followed shortly after by a Garden Warbler only a few yards from a singing Blackcap giving us a chance to reacquaint ourselves with the subtle differences between the two songs - can you tell them apart? 21/04/98 One of our founder members, now in his eighties and still going strong once told me that as a lad he reckoned that the first Swifts always appeared on Knutsford May day, which takes place on the first Saturday in May. I always found this to be the case (plus or minus a few days) until more recently when their arrival dates have become much earlier, despite this years cold weather the first bird appeared over Tatton tonight - picked up by a delighted Derek Pike, well pleased that he'd managed to grip off all the "professionals"!! 19/04/98 The protracted cold spell hopefully appears to be coming to an end with the weather men promising us warmer conditions this week. Perhaps we worry too much about our feathered friends for today we saw the first brood of Mallards on Tatton, Mum with 9 in tow, whilst on Knutsford Moor the Great Crested Grebes have hatched out and were busy feeding at least 3 young. Still 6 Bramblings present in Dog Wood and over the Mere with the other hirrundines the first House Martin of the year- 9 days later than last year. 14/04/98 We often get periods of cold weather with snow showers at this time of the year but the current spell of arctic conditions is more prolonged than in recent years and could be posing real problems for our Summer visitors. Both Chiffchaffs and Blackcaps have of course returned and I was watching a Chiffchaff nest building a week ago, but no song was heard from either species as we walked down to Tatton Mere tonight in a blizzard! A group of c.60 Sand Martins were flying low over the Mere accompanied by c.5 Swallows but no sign yet of any House Martins - these pioneers were feeding on Dipterons emerging in their thousands on the surface of the Mere even in such cold weather. Unaffected by the conditions were a flock of Bramblings feeding in Oaks near to the Outdoor Center and the Crossbills in Swan Clump watched at close quarters today by some friends. 04/04/98 The new RSPB reserve at Conway has give us more options when planning trips to North Wales and this year for the Societies annual trip to the Principality we decided to make this our first stop. Despite the poor weather forecast there was a good turnout of members and they were rewarded with some good birding, we recorded the first Swallow of the year accompanying a small flock of Sand Martins that appeared shortly before a short but heavy shower. When the sun came out we had superb views of two Summer plumage Black-tailed Godwits roosting with a large flock of Redshanks, meanwhile close by a group of 6 White Wagtails were busily feeding before continuing with their onward migration. There were no migrants at our second stop, 500 feet up on Llandudno's Great Orme overlooking the Irish sea across towards Anglesey, by now the rain had ceased leaving a dry but overcast and cloudy afternoon. Conditions were ideal for the birds and how pleasant it was to see the resident Jackdaws enjoying themselves indulging in some spectacular aerobatics - they were accompanied by a pair of Choughs who seemed to be receiving more than their fair share of harassment from a marauding Peregrine Falcon. 31/03/98 Late news of an early Osprey reliably reported from Tatton on 22nd of the month, meanwhile tonight the first Blackcap in song on the Moor where we waited in vain at dusk for any early Swallows, none were seen although a friend had two early today at Marthall. 29/03/97 Up to 35 Sand Martins going to roost on the Moor at dusk during the week but as yet no Swallows, the average arrival date over the past 9 years has been the 2nd. of April, we were optimistic this would have been an early year because of the current mild weather and south-easterly winds but this wasn't to be the case. Nevertheless there was plenty of activity in Tatton with good numbers of Brambling, Redwings and Fieldfares passing through - the Thrushes were accompanied by a fine male Ring Ouzel - a good record for the Park as the species is rarely seen inland in Cheshire at such a low altitude, it's a moorland bird nesting above an altitude of 1000ft. 22/03/98 Last year we were disappointed to report no Lapwings present on their traditional breeding fields in Mobberley when they were visited during the late spring. Encouraging signs on Saturday when we paid an early morning visit to the same location, three or four pairs were on territory with a flock of 10 more birds apparently not yet paired up. Good numbers of Skylarks were in song and both Linnets and Reed Buntings had returned to the area after wintering elsewhere. A large flock of Fielfares, at least 300 birds, were resting in the warm Spring sunshine before continuing with their long journey to the North. 19/03/98 Cool but settled weather at the moment - ideal for migration and our first Sand Martin took full advantage - noted at 08:50 am hawking for insects low over Tatton Mere. This was a lot later than the average over the past few years and fooled most of the entrants in our Sand Martin competition. The least wrong guess! - came from Jerry Uhlman in the good old US of A who's date of March 15th. was the latest and wins the prize for this year. I'll be posting it off this weekend Jerry if I can decide whether VA is Vermont or Virginia! 14/03/98 I thought I'd had the first Chiffchaff today when I heard a bird singing in Dog Wood, but I'd been well beaten by a number of observers who's notes in the Tatton log indicated birds had been present since Thursday (12th. ), a day later than last years first. Still no Sand Martins, but lots of Winter visitors during the week with 75 Fieldfares and 10 Redwings on the 12th. together with no less than 200 Bramblings as well as up to 8 Crossbills gracing the Park with their welcome visit. 12/03/98 Cold, wet and windy - no sign yet of the first migrants. 08/03/98 News today of some early arrivals in the North-west with Wheatears on the coast, Little Ringed Plovers at the Chelford sand quarries and even an Alpine Swift over Marbury Mere. No sign though of any migrants in Tatton Park during a four hour walk this morning (this will come as a disappointment to those who went for the 8th. in the Sand Martin competition - it was the most popular choice!) although I haven't yet checked with other observers, quite often the first records are obtained at dusk as the birds go to roost in the phragmites reed on Knutsford Moor. 01/03/98 No sign today of the Crossbills, but a good count of Society members looking for them! A good selection of other species though with all three woodpeckers, Kingfisher and Grey Wagtail, amongst early songsters there was an encouraging number of Skylarks and Song Thrushes. Stars of the show today were 8 Buzzards in the air simultaneously, the foreshortening effect of our binoculars provided beautiful images as the birds circled lazily in a clear blue sky against a background of the snow covered Pennines. The scene is now set for the return of our first Summer migrants - only seven days to go before our earliest ever Sand Martin record - many thanks to those of you who have entered our competition, watch this space for news of the Winner! 22/02/98 It appears that my recent Crossbill record was the start of a mini invasion! On Wednesday two observers located 3 birds in "Swan Clump" a small stand of Scots Pine to the rear of the Old Hall, this had increased to 10 on Thursday with 5 remaining yesterday. None were in evidence this morning until 11:00am when a group of three flew in from Hanging Bank. Also this week the first Curlews of the Season, a group of 21 returned to the Park - they were seen in the deer enclosure, where today no less than 9 Buzzards were counted. 15/02/98 There's little doubt that over the past few years spectacular progress has been made in the design of bicycles, especially the mountain bikes much in evidence today on the KOS's trip to the Derwent Valley. All seem to have at least 20 gears, full suspension and a complicated on-board computer system, sadly the old fashioned bell appears to have been sacrificed in the interests of weight. In consequence it's wise to keep to the grass verge when birding along this beautiful stretch of Derbyshire countryside, there's no warning, just a whoosh of knobbled tyres and the distinct ouder of supercharged Testosterone! We decided against hiring our own for the day and found ourselves making steady progress along the side of the reservoir in the shuttle bus, the only vehicle allowed past the reception area on a Sunday. Despite the fact that we had paid for the whole journey to the end of the reservoirs, there was a mass exodus halfway along when what looked like a nasty accident turned out to be a group of about 40 birdwatchers obviously onto something! It turned out to be a Rough-legged Buzzard taking advantage of the themals generated by the unusually mild Winter weather, we had superb views of the bird which was eventually joined by a Goshawk, probably a male bird - it was considerably smaller than the Buzzard. No sign of the Ravens or Crossbills but good views of at least four different Peregrines rounded off an excellent day's birding dominated by raptors. 08/02/98 A notable increase in wildfowl during the past week with 167 Pochard and 95 Tufted Duck counted yesterday in Tatton. Also in the past week, a flock of 90 Bramblings on the 5th and a displaying Raven two days earlier. Fewer ducks today where a thrash through the reeds round Melchett failed to produce any Common Snipe, let alone the rarer Jack Snipes that the site is famous for, two overflying Crossbills though were adequate compensation. 02/02/97 The Society was formed in 1974 therefore 1999 is our 25th Anniversary year and so a special holiday is to take place during the Spring of that year. Various locations were suggested, in the end it was decided to hold a secret ballot, the result of which was announced at the January indoor meeting - the vote went to the Greek island of Lesbos, a favourite already with many members and apparently THE place for birding during the Spring migration. Nearer to home, the mild Winter continues with the first Chaffinches spluttering into early song this week and in Tatton all three Woodpecker species very vocal early this morning. 18/01/98 Once upon a time before even Eric Hardy was born Cheshire was covered by sea water and Alderley Edge was called Alderley-on-sea. As the water slowly receded large deposits of salt and sand were the only signs of the Counties nautical history, the sand left is of the highest quality and quarried commercially for use in glass making by companies such as Pilkingtons in St. Helens. The redundant sand workings provide excellent wildlife habitats, some, such as Chelford's Farmwood Pool, have formed deep lakes that in the Summer are home to many species of waterfowl and a safe haven for roosting gulls in Winter. Mobberley's last sand quarry closed in 1966 and by the Autumn of the following year a shallow lake covering about 6 acres had formed - in the early years Redshanks and Little Ringed Plover both successfully nested there. The sand slowly vanished under emergent vegetation but for over 20 years the site provided us with some excellent records as it proved to be something of a magnet for migrant waders, especially in the Spring. A reduction in water level over the past few years has reduced the lake to a muddy puddle by early Summer but perhaps all is not lost - the heavy and prolonged rain of the past few weeks has been most beneficial and Mobberley SQ is looking much more like its former self - just think Green and Wood Sandpipers before work again! 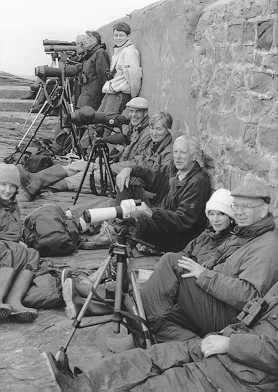 12/01/98 Back in the early 70's before the advent of the various "Birdlines" and mobile phones many local birders used to make the Observatory at Rostherne Mere their last call of the day, giving gull aficionados a chance to show off their skills and the rest of us the opportunity to count the Cormorant roost. As I recall it stood at about 40 in 1972 and during the intervening years has grown to around 300, this is not to everyone's satisfaction of course and our friends the fishermen are less than impressed, somehow contriving to show a good correlation between this increase and their own lack of success - but we all remember their protestations about Mute Swan populations and lead fishing weights don't we! It appears that someone is trying to cut through the emotion and collect some data by ringing the species, a bird seen at Tatton for the past few years has been observed to have a colour ring on its left leg and I recently got close enough to have a close look at the ring. It is two colour, red at the top and white below, the white area is marked with red "C's" and the red half with white "4's". There is also a metal BTO type ring on the right leg - if anyone has any details about this ringing scheme please let me know.